This scan (and several others) was provided by the Wolfe List’s own yclept scooter AKA Debby Montague. Thanks Debby, I really love this kind of stuff! 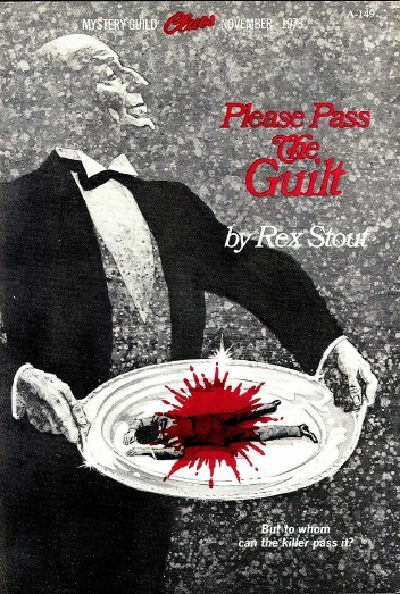 This is the flyer that came with the Mystery Guild version of Please Pass The Guilt. But to whom can the killer pass it? At 4 P.M. every day, Amory Browning, vice president in charge of programming at Continental Air Network(CAN), opened the bottom drawer of his desk for a bourbon bracer. 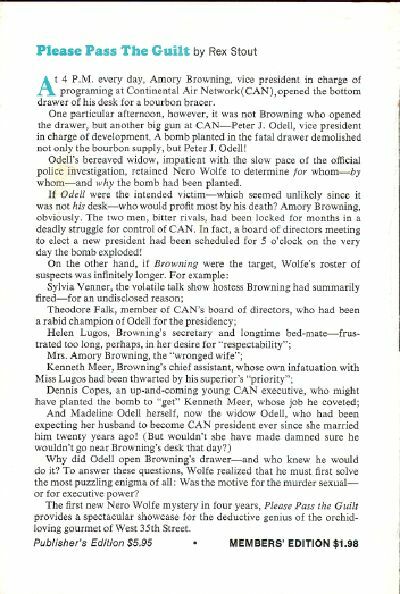 One particular afternoon, however, it was not Browning who opened the drawer, but another big gun at CAN-Peter J. Odell, vice president in charge of development. 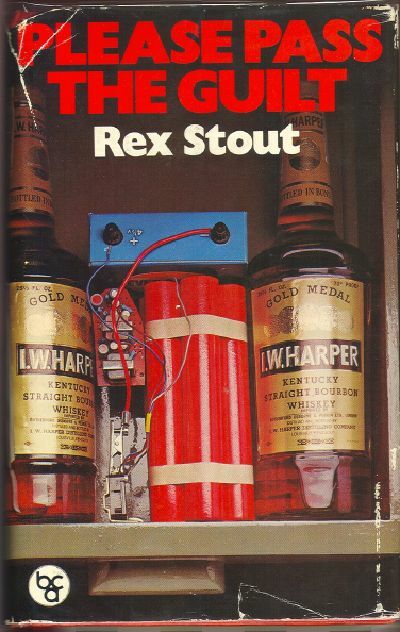 A bomb planted in the fatal drawer demolished not only the bourbon supply, but Peter J. Odell! 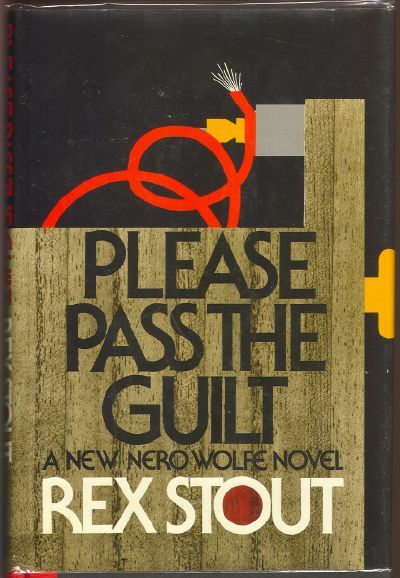 Odell’s bereaved widow, impatient with the slow pace of the official police investigation, retained Nero Wolfe to determine for whom-by whom-and why the bomb had been planted. If Odell were the intended victim-which seemed unlikely since it was not his desk-who would profit most by his death? Amory Browning, obviously. The two men, bitter rivals, had been locked for months in a deadly struggle for control of CAN. In fact, a board of directors meeting to elect a new president had been scheduled for 5 o’clock on the very day the bomb exploded! Why did Odell open Browning’s drawer-and who knew he would do it? To answer these questions, Wolfe realized that he must first solve the most puzzling enigma of all: Was the motive for the murder sexualor for executive power? 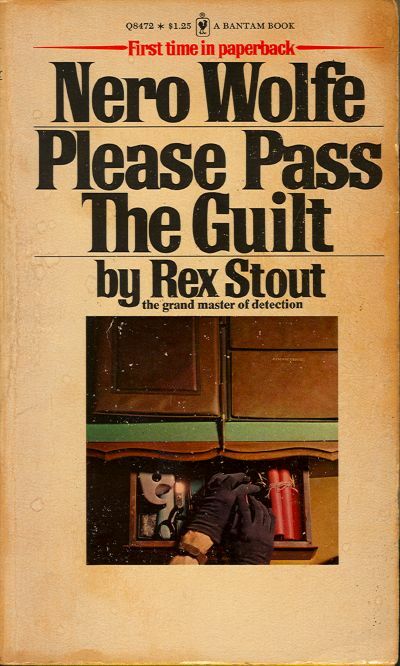 The first new Nero Wolfe mystery in four years, Please Pass the Guilt provides a spectacular showcase for the deductive genius of the orchid loving gourmet of West 35th Street. This cover scan (and several others) was provided by the Wolfe List’s own yclept scooter AKA Debby Montague. 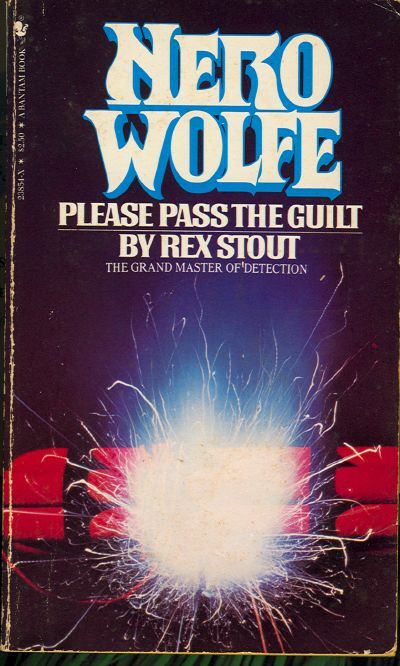 A new Nero Wolfe mystery at last – after a gap of four years – and it will be a delight to all Stout fans. The story is set in the summer of 1969, during that memorable period when the Mets were battling for the pennant and bomb scares abounded in Fun City. The mystery involves the explosion of a bomb in the office of a potential candidate for the presidency of a large corporation; the bomb kills another man, however, and no one can figure out whether the actual victim was the intended victim or not, and of course no one knows who set the bomb in the first place. The unraveling of the mystery, during which Archie encounters his first Women’s Liberationist, is full of suspense, humor, orchids, etymology, and good food in the best Stout tradition. 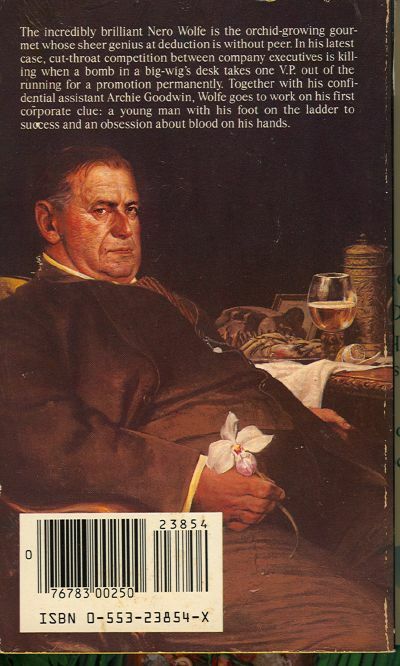 The incredibly brilliant Nero Wolfe is the orchid-growing gourmet whose sheer genius at deduction is without peer. In his latest case, cut-throat competition between company executives is killing when a bomb in a big-wig’s desk takes one V.P. out of the running for a promotion permanently. Together with his confidential assistant Archie Goodwin, Wolfe goes to work on his first corporate clue: a young man with his foot on the ladder to success and an obsession about blood on his hands. A bomb blows up in the desk of a top TV executive. Was it intended for him or the man who opened the drawer? They each had enemies enough to die a dozen times over. Was it the jealous wife or the ambitious partner? The secretary who got passed around like an inter-office memo? Or the man who couldn’t wash the blood off his hands? 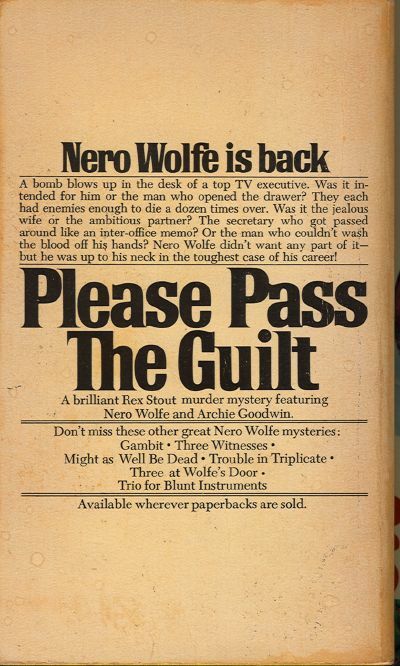 Nero Wolfe didn’t want any part if it – but he was up to his neck in the toughest case of his career!